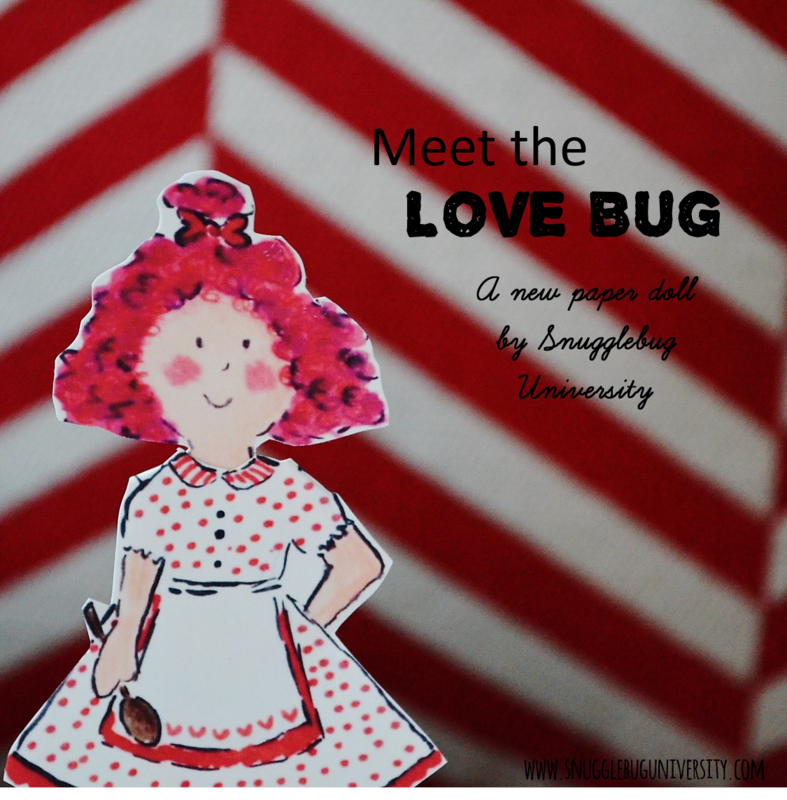 Snugglebug University: The Snugglebug Project: Meet the LOVE bug! The Snugglebug Project: Meet the LOVE bug! The other day I decided to restart the Snugglebug Project, this time with my younger daughter. For those of you who aren't familiar with this project, it is basically an attempt to encourage storytelling. 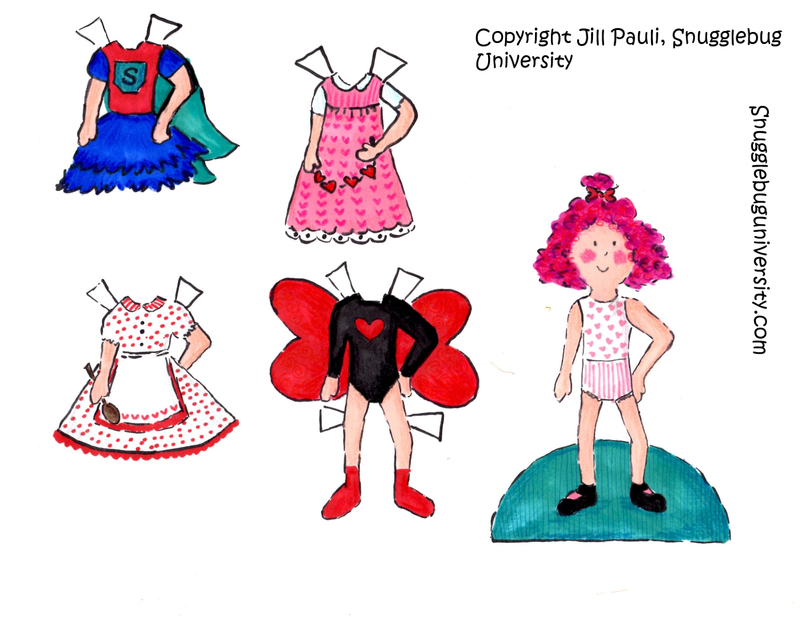 I basically let my kids create a character--they fill out all the major details about what the character enjoys and looks like--and then I draw them up a paper doll. I give them an outlined version that they can color in, and I color one as well (alongside them). My older daughter really loved these exercises, and feels a really strong connection with the characters she has created. We've even made dolls based off of them! My younger daughter loves the Snugglebugs that her sister and I created, so I thought that it might be fun for her to create her own Snugglebug. 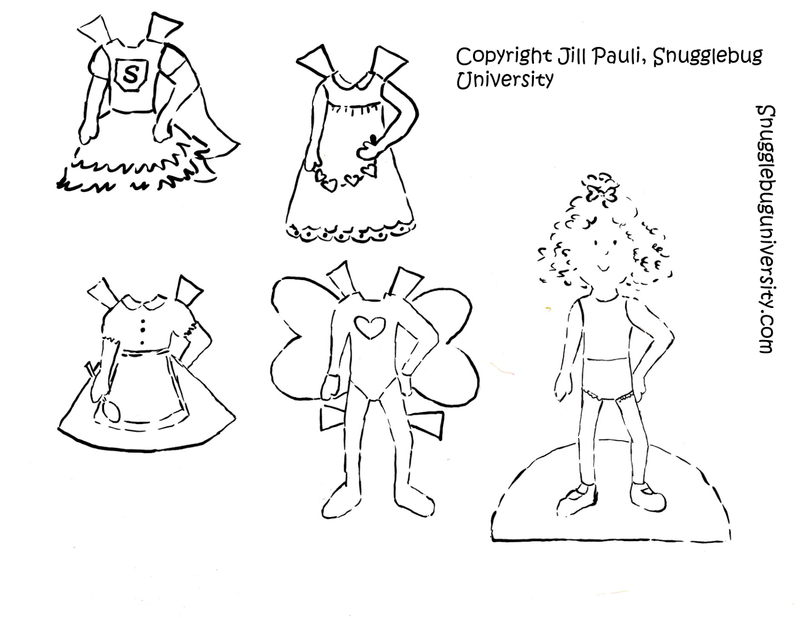 Here on my blog I provide you with a FREE outline version you can color in yourself, so that you can create your own Snugglebug Project with your kids. Since this new bug is the LOVE bug, I figured I'd give you the color version as well for your own personal use. You know...just sharing the LOVE! Here's a recap of all the Snugglebugs we've created, including our latest bug! You can find all the previous bugs here on my blog (Juliana, Cora, Sammy, and Emma) as well as in my shop. But enough about the other bugs, it's time to talk about Sugar--our latest Snugglebug! Ellie was quite adamant that her doll be female and have curly hair (remember the doll I made her for Christmas? Curls are required in our house lately!) She thought it would be very funny for the Lovebug to have pink hair and since Ellie herself LOVES to bake, she thought that should be her Lovebug's passion too (along with playing superhero, of course). I suggested that the Lovebug have some sort of baking name, and Ellie settled on Sugar--which I think is super cute! Lives with: Her mommy and Daddy and her 12 brothers and sisters and... her puppy! She likes to: bake, and play that she's a superhero! Ready to make your own Lovebug? Print the doll out on 8.5x11 inch card stock, and then cut out. If you'd like your doll to stand up, just cut two slits in the base of the doll and place a folded piece of card stock in between the slits. All finished! I hope you enjoy these dolls as much as my kids do! And if you do make your own Snugglebugs, I'd love to hear their stories. Leave a comment below and I'll share your stories with my kids! 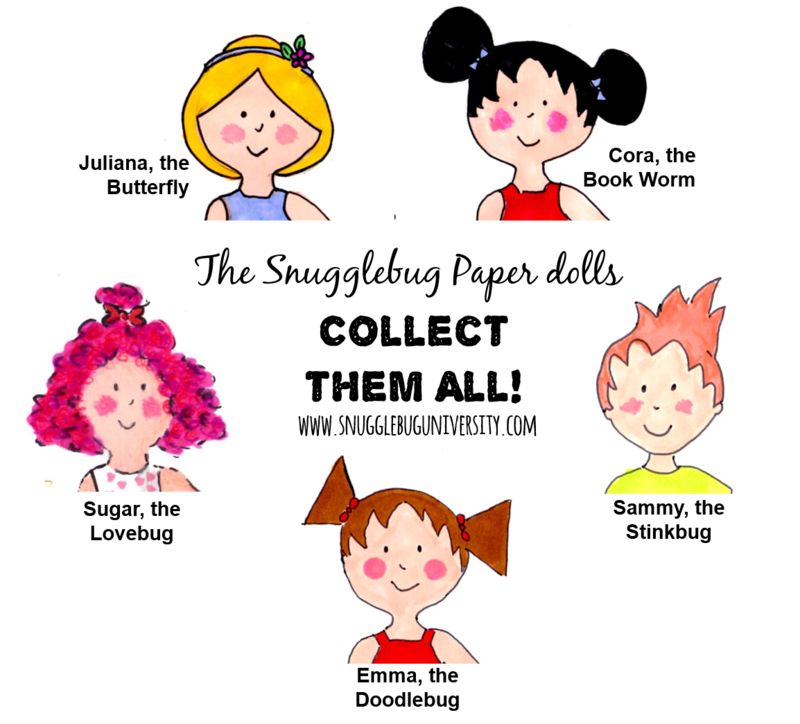 Here are the image files that you'll need to make your own dolls. Please feel free to use them for your personal use. If you do want to use them though, I'd really appreciate it if you'd show my blog a little love by following me via email, facebook, or pinterest. I'd love to take this blog to the next level, and it's really hard to get people to sponsor me when I only have 100 followers :-( So please give me a like! Thanks! I love that you offer this...what great little "biographies" for the Snugglebugs! Thank you so much for making it so easy to copy and paste these dolls into my word program where I can make them a little larger. And it is so super that you have a boy, it is so hard to find boy dolls. Thank you for making these "line drawings", because I simply cannot afford to buy color ink for my printer. What a Blessing you have been to this very-limited-income granny. I plan on printing on cardstock and letting the grandbabies embellish them with glitter, sequins, bits of tulle and fabric, well, you get the idea. I might run a strip of cereal box cardboard up the back to strengthen the doll and clothes for one of my more creative grandbabies. Black and white line-drawings, easy to copy and paste into my word program to modify sizes, hair can be easily modified when they or I are cutting them out, story prompts in their bio, and more, all generously provided by you free-of-charge. Thank you for sharing your amazing talent. Blessings to you and yours from Port Huron, Michigan, USA. If you have anymore boy dolls in the works, maybe one fishing related, I would greatly appreciate it. Thank you again. Hugs from my grandbabies.